Students at Urbana15 GFM Seminar Developing Your Mind for God’s Global Mission. Speaker: Greg Jao. Photo by Rebecca J. Carlson, ESN Scholars participant, Creative Commons license. Many Emerging Scholars Network (ESN) members are either in graduate school, entering graduate school, or considering it in the near future. We’ve had several series and single posts related to the graduate school experience. Whether you’re already working toward your graduate degree or just thinking about it, these posts are intended for you. Note: If you’re an undergrad en route to graduate school start with . . . Developing your Mind for God’s Global Mission: Greg Jao at Urbana 2015. Greg Jao (@GregJao on Twitter) is a vice president and the director of campus engagement for InterVarsity/USA. For seminar audio click here. Why should a missional student ever consider gradschool? — Summary of an Urbana 2015 Seminar by Joshua Swamidass, PhD, a professor in the Laboratory and Genomic Medicine Division at Washington University in St Louis. Note: Josh Swamidass’ research focuses on solving problems at the interface of medicine, chemistry, and biology using computational methods. For seminar udio click here. Bonus: Grad school for God’s Global Mission. — Summary of Joshua Swamidass’ Urbana 2012 Seminar. Although some overlapping material with his 2015 seminar, both seminars are worth prayerful consideration individually and with peers. For seminar audio click here. Headed to Graduate School series by Rick Mattson, InterVarsity Christian Fellowship. Beginning Well: Advice for New Grad Students. Articles gathered from The Well and the Emerging Scholars Network. ESN’s Getting Ready for Graduate School Curriculum. Chandra Crane (InterVarsity Christian Fellowship’s Graduate & Faculty Ministries) shares her journey of being family to a graduate student, unpacking ways of engaging in the unique journey of having a loved one in graduate school. Little known fact: the Wicked Witch of the East was actually crushed by her graduate school workload, not Dorothy’s house. Hannah Eagleson, PhD, shares some hard-won advice from her graduate school experience. Introduction – What happens when you don’t balance your life? If you’re considering an academic vocation, George Marsden‘s slim volume The Outrageous Idea of Christian Scholarship is on the short list of “must read” books. What Difference Could It Possibly Make? A series on Dr. Marsden’s update of his earlier assessment, presented to InterVarsity Graduate and Faculty Ministries staff. How Can Christian Scholars Avoid Privatizing Their Faith? What Role Does Christianity Play in Our Scholarship? Where did you find your megaphone? Who gave it to you? A doctoral candidate in the history of religion shares her journey of finding her voice in the academy and the church. Where Did You Find Your Megaphone? Gender, Calling, and Courage: Lessons from Christian Women in Academia. — How can Christian women find the courage to follow the call of academia, and what does that life look like? At the Urbana 2015 conference, a panel of women in academia share insights into how they find life as Christians and women in the university setting. For seminar audio click here. Bonus: Urbana 2012 Seminar on Find Your Voice and Own It: Women and the Academic Life. For seminar audio click here. 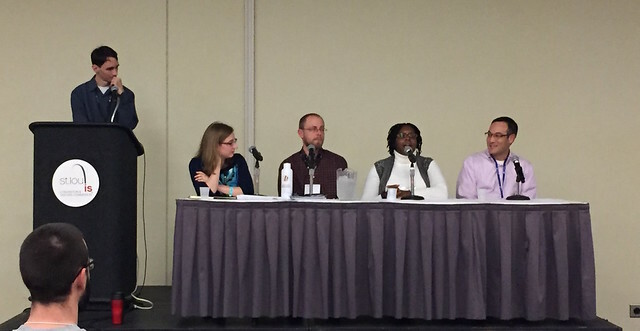 The Secular Academy as a Mission Field: Urbana 2015 Panel Discussion. How can Christians be faithful in secular universities, what challenges do they face, and how can we develop our sense of calling and purpose within academia? For seminar audio click here. A PhD student in theology at Catholic University of America in Washington, DC. Before life as a grad student, Michael was a teacher and principal in secondary education at various Christian schools in the Northeast. Should I Attend Grad School? Or What was I thinking? Jonathan Warren, who recently finished his Ph.D. in the History of Christianity at Vanderbilt University and now serves with InterVarsity Christian Fellowship’s Graduate & Faculty Ministries, reflects upon what he learned from writing his dissertation. While Heather would not likely use the word scholar to describe herself, she has always been surrounded by them. Raised by an academic father and then marrying an academic, she has been connected to several university communities throughout her lifetime. . . . Candidate for What? series by Dwight Schwartz, PhD, shares his academic/vocational journey through Chemical Physics to Graduate & Faculty Ministries with InterVarsity Christian Fellowship. Note: At Urbana 2015, Kelly served on two panels: Gender, Calling, and Courage: Lessons from Christian Women in Academia and The Secular Academy as a Mission Field. What I Wish I’d Known About Faculty Life series by Kevin Birth, a professor of anthropology at Queens College of the City University of New York. Cross-Cultural Teaching—One Story and a Few Tips for North American Scholars. Urbana 2015 Preview by Brian Dennison, the Manager of Faith Learning and Service at Uganda Christian University where he also serves as a Lecturer in the Faculty of Law and Coordinator of the Clinical Legal Education Program. The Missional Professor in Universities Outside North America. Urbana 2015 Seminar by Dr. Keith Campbell, vice president of Global Partnerships for Global Scholars spent four years teaching New Testament at Shanghai University in China. He’s also the author of Researching Abroad: Tips and Tools for the Trade. Dr. Liam Atchison helped answer questions from the audience, is vice president of US relations for Global Scholars. He has been a church-planting pastor, a university professor, and an academic dean at Western Seminary. For seminar audio click here. Serving Christ as a Professor: Suggested Readings from Urbana 12. Note: Looking to update this list in 2016 by drawing from a variety of sources including Dialogue Within the University: A Reading List (Bob on Books) and Enjoy Campus Resources from IVP 🙂 Please do not hesitate to share your recommendations. Writing a Christian Personal Statement series by David, a medical resident. Note: A sample offered by Mary Poplin, PhD, a Professor in the School of Educational Studies at Claremont Graduate University.